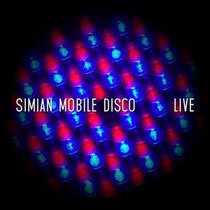 This spring, Simian Mobile Disco will release their first live album since the duo’s conception in 2005. ‘Live’ is a mix of SMD releases, past and present, with some reworkings of some of their most infamous tracks. ‘Cruel Intentions’, ‘Hustler’ and ‘The Beat’, for example, all feature and the end result is a blend of precise electronics, danceable rhythms and aptitude. James Ford and Jas Shaw, aka Simian Mobile Disco, earliest explorations were a strain of indie dance that resulted in ‘Attack Decay Sustain Release’. With their ever-evolving sound, they went onto release ‘Temporary Pleasure’, which featured a plethora of vocals from the likes of Alexis Taylor, Beth Ditto and Jamie Liddell. Most recently, they have released techno 12” compilation, ‘Delicacies,’ and last year’s ‘Unpatterns’. ‘Live’ is an album recorded whilst on tour last year, during a performance in Philadelphia. With a background of techno rhythms and bounce as well as some vintage analogue electronics, it captures the sound of SMD and is being released on their own Delicacies label. This February the duo will begin a five-date tour of Europe to warm up for summer festivals worldwide.